As you know, Sunday were the 54th Annual Grammy Awards so Monday, I was a busy boy. First I filmed my TV Guide 2012 Grammy Awards Fashion Wrap with host Ali Landry, Tabatha Coffey and Camille Grammer. After wrapping around 2PM--with enough time to grab a lunch--I then headed off to the NBC Studios in Burbank. As the Fashion Spokesperson for my Alma Mater, the Fashion Institute of Design & Merchandising/FIDM, I have the pleasure of being invited to do my post-Award "Fashion Visit" with the NBC-LA crew, specifically, anchors Chuck Henry and Colleen Williams. A couple of weeks back, I was on to comment on the 2012 Golden Globes Red Carpet, so this time they invited me back to give my "Nick V. Red Carpet Two Cents" on the Grammys Fashion. Along with anchor Colleen Williams, I talked about my Favorites and "Best Dressed" (Taylor Swift, Carrie Underwood, Adele...), some of my "Could Have Been Better" (Robyn??) and we ended with Miss Nicki Minaj's Custom Atelier Versace Littel Red Riding Hood-Meets-Cardinal red satin cape ensemble. As always, I had a fun time commenting, describing the looks and why I liked them (or not) as well as giving some "Fashion Instructor" educating on Haute Couture and what that means, different menswear collars and designer info. In the end, even Chuck Henry (above left) got into the conversation--commenting on my tie--saying "Nick, that's an interesting tie...". I think we may have a new Fashion Red Carpet expert on our hands!!! 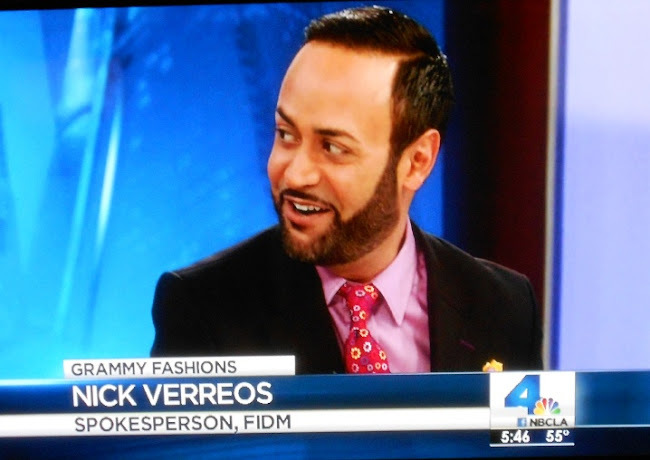 0 Response to "NICK APPEARANCES.....Nick Verreos on NBC-LA News Discussing Grammys Fashions"